If you’ve logged in since Patch 0.6.1637 you’ll have seen dropships circling in the sky like birds of prey. These vehicles act as a fast travel system for New Eden, carrying you from town to town. Dropships stop at each major town and almost all of the minor SIN towers as well. They’ll land for a few moments before moving on, giving you a chance to enter. Press E to enter a dropship, and E to leave again – if the ship’s not on the ground when you leave, you’ll drop out on glider wings. You can enter from mid-air if you glide or jump-jet to a ship in flight, too. 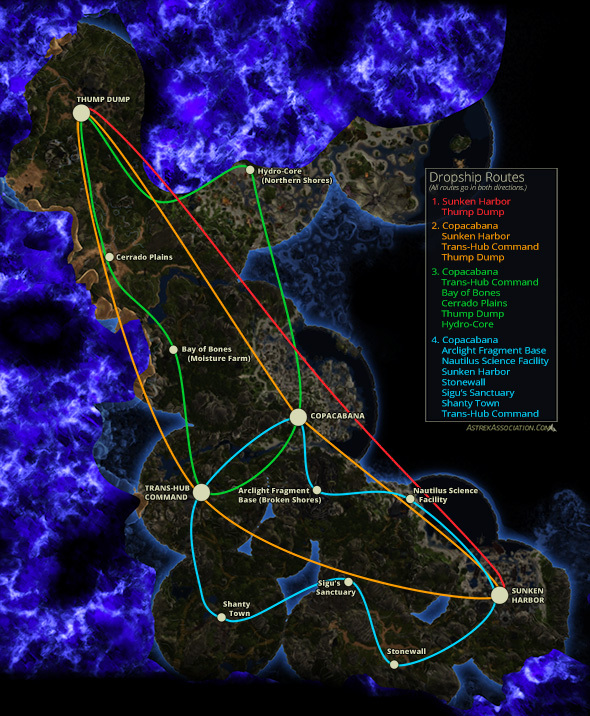 For your convenience, here’s our Firefall dropship route map. (Click the image for a bigger version.) This is only a preliminary version; we’ll keep refining it as routes are added or changed. Note that all dropship routes operate in both directions. If you want more in-game information, we recommend Arkii’s great addon Airii, which will give you an in-game display board with arrival/departure ETAs next to each dropship landing pad. You could improve this article by adding travel times so players have a rough idea of how long they’d have to wait for a dropship to return. Unfortunately travel times are somewhat variable at the moment because of the way dropships change destination based on Chosen POI control, and the times don’t seem to be entirely consistent anyway. It’s definitely something we’ll look at though! Does the Thump Dump – Sunken Harbour drop-ship actually go through the melding wall? I gotta test it out the next time I fly that route. When you say Northern Shores, do you mean the Esqueleto Beach watchtower? I’ve been able to glide to that from the Hydro-core dropship if I eject just north of Mushroom Rock. Great help for sure. I printed this off. I have a small question though. Regarding to the ETA’s on the dropships, is there a rough estimate of how many minutes we can expect or time?..Or will it not always be the same route?